Eight 'rebel' lawmakers of the Janata Dal-Secular (JD-S) face suspension from the regional party for 'cross-voting' in the biennial election to the four Rajya Sabha seats from Karnataka on Saturday, a party spokesman said. "Eight of our MLAs (lawmakers) face suspension for defying the party's whip and cross voting in favour of the Congress candidate (K.C. Ramamurthy) instead of voting for our official nominee B.M. Farook, who lost the contest," JD-S spokesman Ramesh Babu told reporters here after polling ended.JD-S supremo and former Prime Minister H.D. 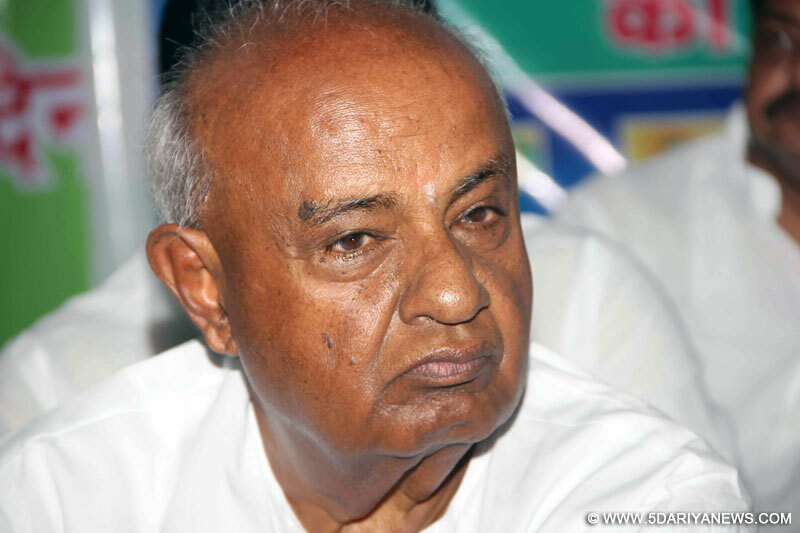 Deve Gowda has called for a meeting of the party's legislators on Sunday here to discuss the poll fallout and act against the rebel lawmakers. "Action will be taken against them (rebels) in accordance with the provisions in the party's constitution," Babu asserted.Among the prominent rebel lawmakers are Zameer Ahmed Khan from Chamrajpet assembly segment in Bengaluru, N. Cheluvaraswamy from Mandya and H.C. Balakrishna of Magadi near Bengaluru.Though the JD-S has 40 lawmakers in the 225-member legislative assembly, Farook polled only 33 votes, 12 short of the required 45 votes to win a seat in the upper house of Parliament.One of the 14 independents had voted for Farook, while the remaining voted for Ramamurthy.While the ruling Congress got its first two candidates -- Oscar Fernandes and Jairam Ramesh -- winning comfortably with both of them polling 46 voters each, Ramamurthy secured 52 votes, including 32 surplus votes from the party and 20 additional votes from rebel JD-S lawmakers and independents. A candidate requires a minimum of 45 votes to win a RS seat from the state.With votes from JD-S and independents, the ruling party's third candidate (Ramamurthy) defeated Farook of the JD-S.BJP's Union Minister for Commerce and Industry Nirmala Sitharaman won the fourth seat with 47 votes, including 44 of the main opposition party (BJP) and three votes from the members of its regional allies - BSR-C and KJP.In the 225-member legislative assembly, which is the Electoral College for the Rajya Sabha election, the ruling party (Congress) has 123 members, BJP 44, JD-S 40, independents 9, BSR-C 3, KJP 2, SKP 1, KMP 1, speaker 1 and nominated 1. Ahmed also voted in favour of Congress candidate Rizwan Arshad on Friday in the biennial election to seven seats of the state legislative council, defying the party leadership, especially Gowda and his younger son and former state Chief Minister H.D. Kumaraswamy.Defending their decision not to vote for the party's nominee, Ahmed told reporters that the "arrogant attitude" of Gowda and Kumaraswamy was the reason for their defiance. "Farook was fielded for the seat without taking us into confidence, as we were short of five votes and most of the independents voted in favour of the Congress nominee (Ramamurthy)," Cheluvaraswamy said on the occasion.As the Rajya Sabha polls are held with an open ballot system, every voter has to show the ballot paper to the respective party's official agent before casting the vote.